Deepika Padukone and Ranveer Singh tied the knot on 14 and 15 November in Italy. 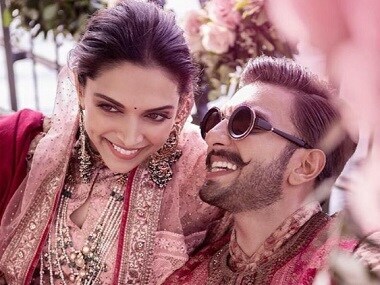 Deepika Padukone Ranveer Singh wedding latest updates: They have also released their first official portraits — one each from their Konkani and Sindhi wedding ceremonies. Exactly what the headline says. Also, because we need keywords: Deepika Padukone Ranveer Singh wedding latest updates. Deepika Padukone and Ranveer Singh married in a traditional Konkani ceremony on 14 November, which will be followed by a Sindhi Ananad Karaj ceremony on 15 November. Deepika Padukone Ranveer Singh wedding Latest Updates: While photos from the Ranveer Singh-Deepika Padukone wedding remained a closely guarded secret well after they tied the knot in a traditional Konkani ceremony at Lake Como, on 14 November 2018, a few images shared online indicated the bridal party having a blast at the venue. Deepika Padukone and Ranveer Singh will marry in a Sindhi Anand Karaj ceremony on 15 November.